We design, build and host advanced Speech Technology solutions that provide first-class customer experiences. 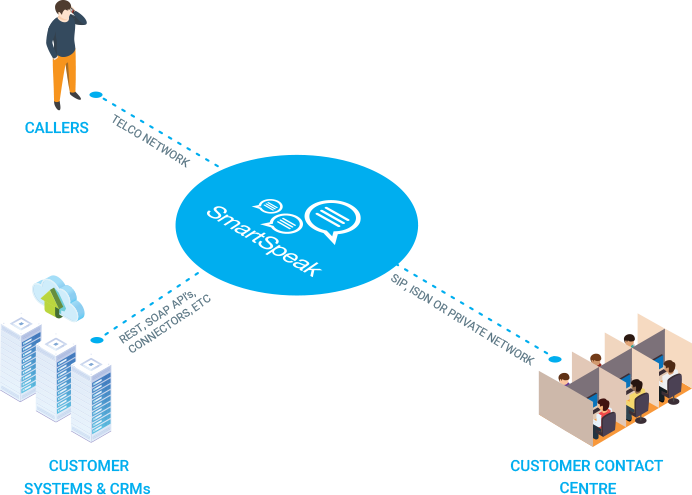 Every SmartSpeak solution is uniquely tailored to the individual client and their needs. We gather all available data from our clients to improve their customer experiences. SmartSpeak is all about understanding your customers. We identify their behaviours and the pathways they follow to enquiry. Working with our clients, we continuously refine their Speech Technology experiences, optimising call outcomes and caller satisfaction. Natural Language Processing combined with advances in supporting technologies (such as AI and Voice Biometrics) make this advanced level of engagement possible. Our Speech Technology solutions integrate with our clients’ existing systems and data to provide these seamless managed experiences. Customer experiences should cross platforms. We aim to help customers in their chosen channel (calls) and, where possible, integrate with other channels for example, e-mail & sms to create seamless transitions. SmartSpeak solutions are never based on a one size fits all, off-the-rack approach. Every solution is tailored to meet the needs of our clients and their callers – from the technology used to the customer experience design, style and system integration. Businesses are constantly changing and technology is always improving. Creating a first-class customer experience means always looking for ways to upgrade and never settling for just OK. We do this by constantly monitoring and reviewing our solutions to see how we can make them better. A great speech solution should be like human language – regularly changing, evolving and adapting to the needs of its users.